Based in Råå and shown by US Navy 1961  as E.R.N. Råwall, as opposed to Lloyds, with a blue flag and a very broad yellow horizontal band bearing a blue "R" towards upper hoist and another towards lower fly. Operating in the 1950s he appears to be the successor to A.R. Råwall who is noted pre-World War 2. Operated Rederi A/B Brubor from before World War 2 until 1962 when it was acquired by Transmarin A/B who continued to run it for a few years. His flag was yellow with a green "B". Some sources show a blue "B" but the flag badge in Collectors Corner supports the green version. The flag appears to be more correctly that of Rederi A/B Rex, Stewart being the only source not to mention the connection. A/B Rex appeared in Lloyds 1912  showing under the control of Wald Beijer. By World War 2 it appears under J.M. Källström and then post-World War 2 by Ragnar Kallström and then by 1970 under Salénrederierna though what livery was then used is unclear. The exact design of what appears to be a compass needle varies with sources with Lloyds showing a bigger design than all others and having a black ring on a solid core. Most others show a design like that depicted by FOTW although judging by that appearing on a funnel the white ring should be a lot thicker. To confuse matters a bit more the flag on the cap badge appearing in Collectors Corner shows a gold ring. White flag, blue saltire; in center white disk bordered blue, charged with red "N". Rederi A/B Ragne was formed by Ragnar and Signe Nilsson and is a combination of their names. Ragnar had been the manager of Fredrik Olsson & Co. with Signe being a daughter of the owner and the company resulted from her share of the family estate. Subsequently the company was operated by their son Lennart Nilsson with financial problems leading to the sale of the fleet by 1979, at which time use of the flag probably ceased, although the company continued to operate as Ragne-Rederierna operating a ferry for Rederi A/B Goteborg-Fredrikshavn Linjen. In 1981 it was bought by L. Jeansson and had a brief revival for a couple of years as Rederi A/B Ragne before folding completely. Whether there was a flag at this end stage is unclear with a funnel report showing a lighter blue flag bearing a white "K" as the emblem but as this letter has no apparent connection with any of the connected parties its significance is unclear. I always understood that the Rex Line (Ragnar Kallstrom) house flag and cap-badge was in fact a compass needle, and that it was inclined at about 59 degrees being the Latitude of Stockholm. Apparently formed in 1933, it is part of the Jönsson Novabolagen group with its ships all chartered out. The flag design is as shown by Jarig, but going by the cap badge from the Collectors Corner site and the Josef Nüsse table flag the dimensions are 1:2. The new site of Josef also shows a different blue shade to that in his old site and to the cap badge as these have indicated a dark blue field but now a more softer shade is shown [see se~n743.gif attached] which may result from newer processing methods of images rather than any actual colour change. Operated by Ove Swensson of Helsingborg in the 1950s with US Navy 1961  showing a blue flag with a white "R" of straight lines. There appears to be a company of the name still operating in maritime matters but whether it is connected is unclear. 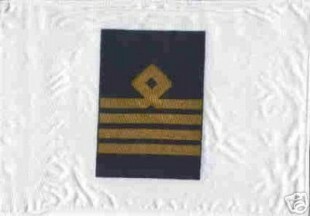 A one ship company of the late 1950s and early 1960s with the Collectors Corner cap badge showing a white flag with the blue letters "RS". Formed 1988 and based Ystad I have traced it for 10 years but existence thereafter is unknown. The Josef Nüsse  table flag shows white with 4 horizontal red lines broken by the field with on this break a black "S" within a double red bracket. Underneath the design is the black legend 'SANDHAMMAREN . SHIPPING AB" with the dot being enhanced. The flag is double sided and as with any table flag that bears small lettering I suspect it may not have been used at sea. As explained on the site, Sandinge is a family business founded in 1971, active "around the Swedish coast, Norway and Denmark". Services offered are towing, icebreaking, salvage, heavy lifts, and vessel brokerage. Apart from Lysekil vessels are also stationed at Uddevalla, Gothenburg, and Skoghall. Certainly orange with large serifless initials "SBS" (white) in the upper two thirds of the field, but could there be some additional words in the lower part, also white? There is definitely something more there, but it is impossible to make out what. I am amazed comapnies are not presenting their flags in detail on their homepages! This picture is taken in Gothenburg harbour. ship: M/S Munksund, built 1968, Upphuggen 2001 i Indien; blue flag, three white outlined triangles in flag center, placed 2,1. Svenska Cellulosa A/B was formed 1929 as the holding company for 10 companies in the Swedish forest industry and is today an international company. Originally it operated its ships registered under its own name through operators but in 1967 SCA Transport A/B [as it shown in Lloyds] was formed as it took over operations. The logo adopted in 1941 was based on a sawtooth showing as a ring with a finely serrated inner edge which enclosed a crown above the letters "SCA". There are several flag variations shown. Two originate from cap badges on the Collectors Corner site, one being a green swallowtail with the outer edge of the sawtooth appearing to be a dark grey and thus allowing the emblem to be in green with in this case small diamonds being placed on either side of the letter group of which the "C" is larger [see leftmost image above]. A second badge shows a royal blue field with the emblem [no diamonds for this or other versions] in gold within a gold frame [second from left, above]. With the change to SCA Transport A/B, which also appears to be called SCA Shipping by the company, a table flag appears on the Josef Nüsse site being white with a mid blue panel bearing the logo in white [see centered flag, above] but from a photo of the "Munksund" I find the actual house flag at sea was entirely blue of a lighter shade, going by the print, with the logo in white [see second from right, above]. In 1990 the company changed their logo to one of 3 interlocking triangles to represent their three business areas of hygiene products, packaging and graphic paper. This has lead to the flag shown by Jarig which his source appears to have taken from Brown 1995 . Its existence as a shipping flag would have been brief because the company divested its shipping interests in 1991, chartering the ships back through its newly named SCA Transforest A/B [which still operates] under a different livery again but no flag found. I have some doubts about the triangle bearing flag as shown because it does not equate with the actual logo and I also have a rough drawing made by another source which indicates that it was indeed the official version of the interlocking triangles above the letters SCA all in white which appeared on the funnel. Whether the lettering also appeared on the flag is not known but assuming that it did not then it is possible that the flag was actually as shown now depicted at the far right, above. Whilst the company site shows the logo in a bluish metallic colouring on white I did find one example on a building side of the logo and lettering in white on a blue background. In 1964 the small Waxholmbolaget ferry "Saxaren" was wrecked and declared a total loss. The remains were sold the Staffan E. Lindhé and Hans Johansson who proceeded to restore the vessel. Lindhé became sole owner in 1966 and appears to have started operating it again being later joined by the "Sagan". The "Saxaren" was sold in 1972 but "Sagan" remained and he placed it under the ownership of Rederi A/B Saxaren until the end of the 1980s. The flag as shown by a Collectors Corner cap badge was a swallowtail divided vertically blue to hoist, occupying 1/3 the field, and yellow with overall a pair of black scissors. The flag is similar to that of Waxholm except the field colours are reversed and the emblem is replaced by a canting with "sax" or "saxen" being Swedish for scissors. The company is apparently still in existence though no longer a shipowner. Also known as SCOL Shipping A/B or SCOL Rederi A/B. Based Stockholm they appear to have been charterers only. The flag from Josef Nüsse  is white with a captain's sleeve showing 4 gold bands and diamond curl. Brown 1982  shows 5 bands but I was assured that this was incorrect by Tasman Express Line, a New Zealand company that were permitted to use a slight variation of the livery after they had subleased their two vessels from SCOL. Known to be in existence in 1973. Scol was founded by my father and three associates in Stockholm in the early 70's and m ore than less ceased operations in the mid 80`s. 1986 I think. The rise and fall of this company is a story of its own. On its peak it was represented in offices at every major seaport town across the globe. The company was charged by the Swedish eko-rotel (economic crime police) in 1974 for the unlawful moving of funds outside Sweden. (This was before currency was allowed flow free from Sweden) These moneys were used to bribe and pay off people who needed to be bribed and paid off, in order to get any business done. They had actually at times applied for permission to do exactly this but always been turned down as such a thing did not exist. The case lasted for twelve years and was finally dropped on all 50 accounts in the original charge. By that time of course the company was bankrupted since long as the procedure had made it impossible for Scol to deal with any sort of bank or financial institute whatsoever. No compensation of any kind was ever paid out nor were any mistake of the Swedish eko rotel acknowledged. The company's name was made up by the famous Swedish restaurant owner �ke Söderqvist. He also came up with the logo. He had nothing to do with the company itself but was a friend of the founders. Scandinavian West Africa Line � no homeport mentioned; ship: Vikaren. A blue swallowtail with a broad white diagonal from top fly to bottom hoist, charged with capitals SWAL. The firm's seat is, or was, Göteborg (SE). Set up during WW2 by a consortium of Rederiaktiebolaget Transatlantic, Det Bergenske Dampskibsselskab and Fearnley & Eger A/S to service the Portuguese colonies in west Africa.